Hi loves! I'm back with more Dance Legend shades, this time featuring 4 shades from two Anna Gorelova by Dance Legend collections. Anna Gorelova is kinda like a unicorn - she has the most perfect nails, gorgeous swatches, amazing pictures, and everything she showcases looks just SO perfect. She also creates collections regularly together with Dance Legend and those polishes are as unique and beautiful as the girl herself. Like I said, I reviewed 4 shades from two different collections, and all polishes except for one were more sheer than I like them to be. I definitely needed 3 coats for proper opacity but they did apply easy and thin. Anna Gorelova by Dance Legend Заря is part of the Summer 2015 collection. This is a UV-responsive shade, meaning it'll transition color when you go into the sun! The formula was very sheer, I stopped at 3 coats but ideally would have added a 4th for even better coverage. It dries matte so topcoat is a must. The lightest shade is without UV exposure, the darkest shade is after UV exposure. Anna Gorelova by Dance Legend Невод is also part of the Summer 2015 collection. This happy turquoise base is filled with golden flakes. Unfortunately, the flakes "surface" when you paint on this polish, the formula is quite thin so you need 3 coats and good layer of topcoat for proper opacity and coverage. Anna Gorelova by Dance Legend Лютый is part of the Winter 2015/2016 collection. It is a gorgeous grey filled with copper, silver and green flakies. This was the stand-out formula-wise, it was opaque in 2 easy coats! I also love the finish on this one, very complex but still very wearable because of the basecolor. 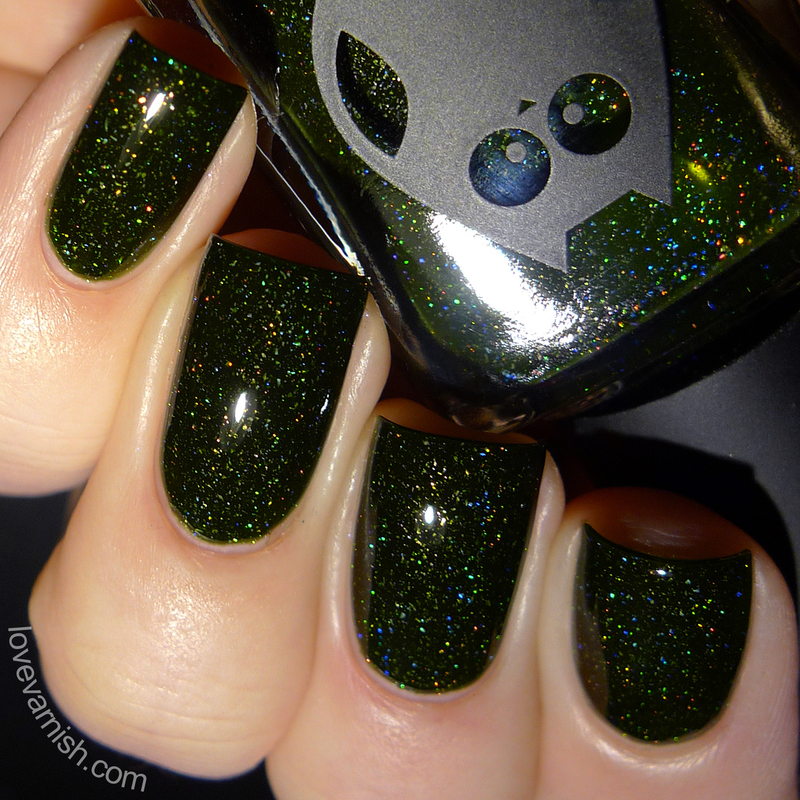 Anna Gorelova by Dance Legend Серпень is also part of the Winter 2015/2016 collection, It's a lovely forest green filled with tiny holo sparkles. This reminds me of the Sparky collection actually, and the formula was quite similar too, though this one adhered better at the first layer, so it was easier to build up to opacity. Still needs 3 coats! While I love some of these colors, I am not too pleased with the sheer formula on most of them. The stand-out for me is Лютый because of the gorgeous finish and the creamy formula, but I also love Заря since I never had a UV-sensitive polish before :D.
Which of these catches your eye? And have you ever tried any Anna Gorelova by Dance Legend shades? Tell me in the comments! Dance Legend is sold through their own webshop, and ships internationally. Anna Gorelova by Dance Legend shades come in 12 ml. bottles and retail for $10.